Cerro Candelaria where the Puro Ecuadorian Rainforest Reserve lies, has several species of monkey. The Capuchin (also known as the ‘organ-grinder’ monkey, which are often seen in films), the Red Howler, the Subtropical Night Monkey, and a few others. So, what keeps their population in check? Few predators can catch them up in the trees, but Luis recently found one predator that can. One day, Luis was up in a forest tree picking fruit when he saw an enormous Black and Chestnut Eagle. It was flying low over the forest with something hanging from its talons. Initially Luis thought the object in its grip was a big snake. As the eagle circled, Luis realised that the “snake” was in fact the dangling tail of a monkey. The monkey was being carried through the sky to be dismembered and eaten by this giant eagle and maybe even its nestlings. Luis had unfortunately left the camera on the ground and was unable to get a picture of this spectacle. Luis has had many sightings of this eagle since he began working for EcoMinga. The accompanying photo was taken by him in Cerro Candelaria. Luis is an extremely keen photographer and revels in taking pictures of the abundant animal life of the forest. This picture shows a young eagle whose colouring’s are mainly white, but will turn darker as it matures. 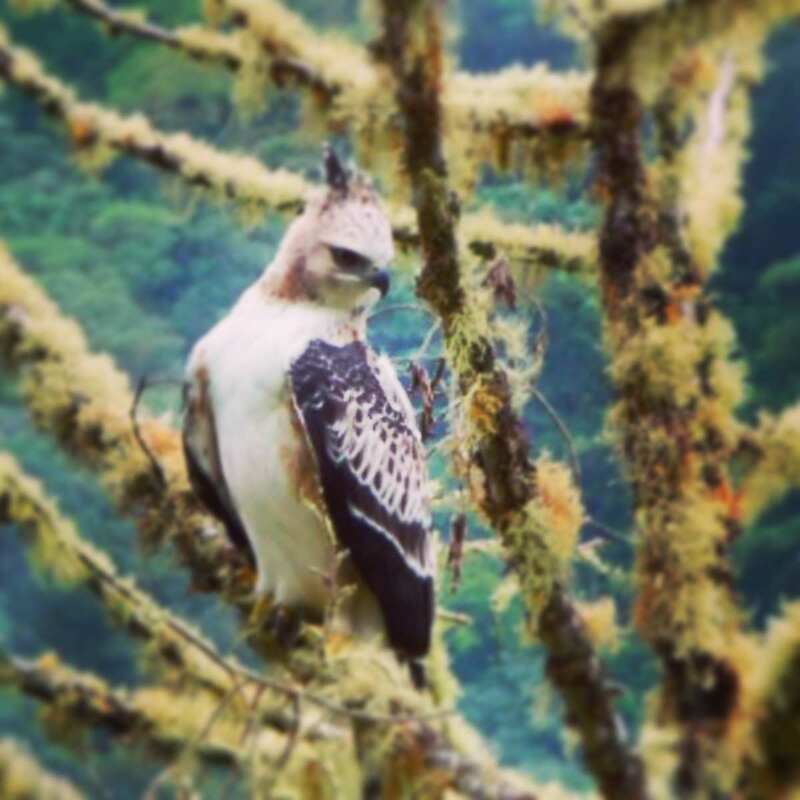 The eagle is one of the most threatened birds in Ecuador. The total population size in Ecuador has been estimated at about two hundred adult birds. EcoMinga’s reserves hold at least six adults (three pairs) and possibly more. These eagles eat chickens as well as monkeys, and therefore often shot by local people when seen to be stalking their livestock. Luis and his brothers believe they have found a solution to this problem. It appears that the eagles are afraid of turkeys, and will not attack a group of chickens that is accompanied by a pair of turkeys. Though this theory hasn’t been rigorously tested yet, it is a clever suggestion that might help avoid the conflicts which endanger the eagle’s survival.